On 15th December 2010, in the 22th meeting of SCST, the National Science, Technology and Innovation Strategy (2011-2016) document has been approved. The continuation of the pace on the improvement of RDI capacity achieved through BTP-UP (2005-2010) have been one of the main motives behind the National Science, Technology and Innovation Strategy (2011-2016). The vision of the National Science, Technology and Innovation Strategy (2011-2016) is "to contribute to new knowledge and develop innovative technologies to improve the quality of life by transforming the former into products, processes, and services for the benefit of the country and humanity". In line with these targets, within the period 2011-2016, disseminating culture of multilateral and multidisciplinary RDI cooperation, stimulating sectoral and regional RDI dynamics, encouraging SMEs to become stronger actors within the national innovation system, and enhancing the contribution of research infrastructures to the knowledge creation capacity of TARAL are defined as the main focus points within the national innovation system. 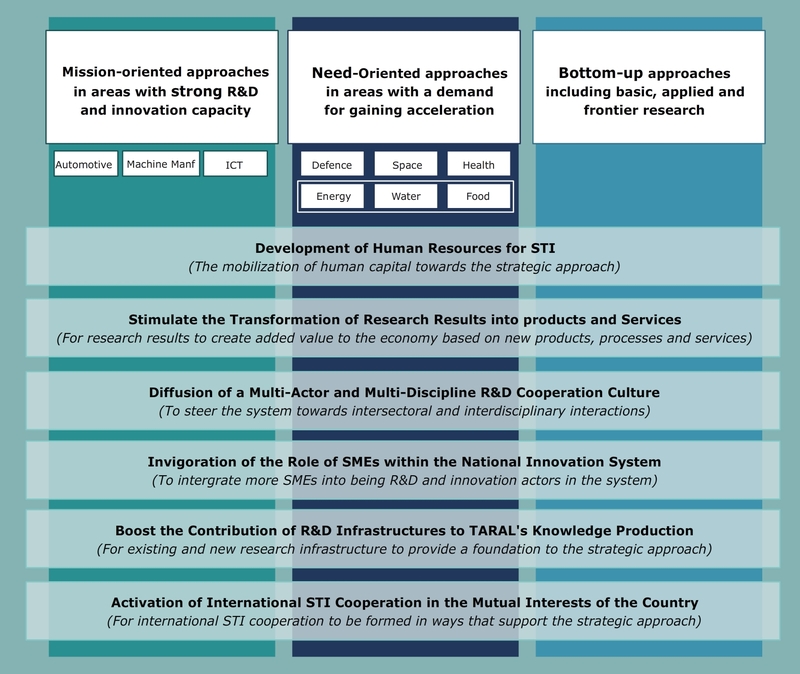 In order to deal with these necessities, within the National Science, Technology and Innovation Strategy (2011-2016), mission oriented approaches in areas with strong RDI capacity, need-oriented approaches in areas with a demand for gaining acceleration, and bottom-up approaches including basic, applied and frontier research are identified. The strategic framework of National Science, Technology and Innovation Strategy (2011-2016) comprises of three vertical axises and six horizontal axises that serves to the vertical ones ( Figure 1). At the 25th meeting of SCST, which was held on 15th January, 2013, health sector included within national prioritized areas in regard to decree no. 2013/106.